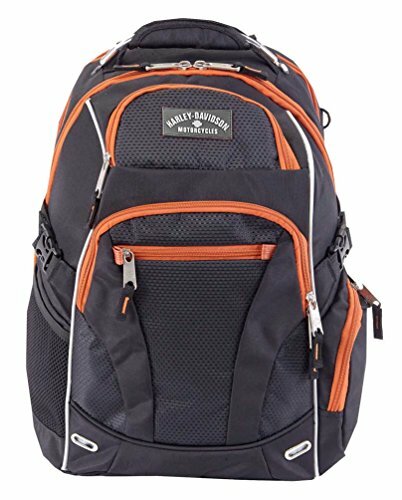 Harley-Davidson Renegade Backpack, 99206 RUST/BLACK. Hide away rain jacket. Super strong, easy to carry, and super lightweight. Top steel cable handle. Back side, extra padded and cushion back support. Back features contour air flow design. Straps have fast adjusting finger clips. Sides have compression straps with fastex clips for space adjustment. Protective "Eye Pod", eyeglasses and sunglasses protective casing with soft non scratch interior. Interior deluxe map lining. Extra large self healing zippers with extenders for grip with gloves. Laptop and iPad protected pockets. Size: 21" x 13" x 8".